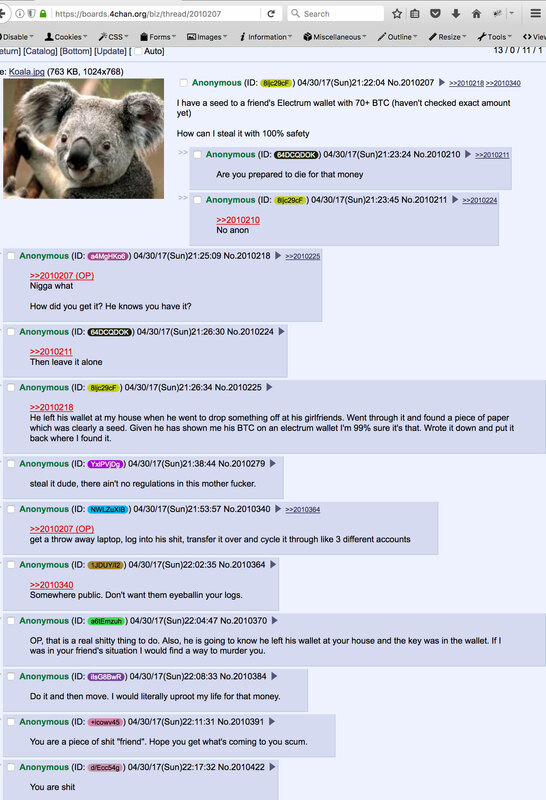 On 4chan, an anonymous user claimed to have a seed to his friend’s Electrum Bitcoin wallet. He then asked the community for a method to steal funds of the wallet equivalent to 70 Bitcoins. On 4chan, a simple image-based bulletin board designed to operate as a forum, an anonymous user claimed to have a seed to his friend’s Electrum Bitcoin wallet. He then asked the community for a method to steal funds of the wallet equivalent to 70 Bitcoins. Seed or wallet words to a Bitcoin wallet like Electrum or Multibit is an important component necessary to back up funds. If a user accidentally deletes wallet information or has his computer stolen, the user can locate his wallet words or seed to recover his funds. However, the Multibit development team strictly warned its users against leaving wallet words or seed exposed. With two simple steps, anyone that holds a seed or wallet words to a Bitcoin wallet can steal funds. The first step is to obtain the seed. Then, once the wallet backup folder is located on the computer, using the seed, funds, notes, payment history and exchange rates in payments can all be stolen without a trace. On the 4chan bulletin board discussion, an anonymous user explained to the community that he found the seed to his friend’s Electrum wallet. For localized Bitcoin wallets, seed or wallet words is the most important security component to protect. With one string of words, as seen in the image above, 70 Bitcoins can be lost. By today’s exchange rate, as of May 1, 2017, the wallet owner’s clumsy and irresponsible action to store seed words in a public place will cost him at least $99,330. The anonymous user noted that they could be more funds stored within the wallet. This unfortunate event and the loss of 70 Bitcoins should be considered as a reminder for the rest of the Bitcoin community to implement appropriate security measures and keep seed words safely.